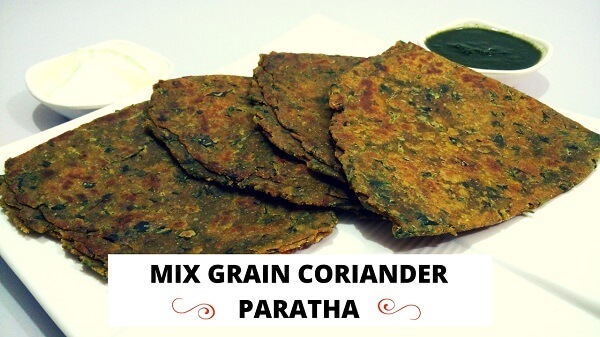 Healthy and straightforward Multigrain Coriander Paratha are quick to prepare for a rushed morning. Delicious parathas served as breakfast, main course or even for kids lunch box. Kothmir Parathas tastes delicious with Curd or green chutney. Try this easy recipe to prepare delicious Kothmir Parathas at home. To prepare the dough, add Wheat Flour & Multigrain Flour in a large bowl. Add Fresh Coriander, Ginger-Garlic-Chilli paste, Red Chilli Powder, Garam Masala, Carom Seeds, Turmeric Powder and Salt. Add 1 tbsp. Ghee and mix well all the ingredients. Now add water as required and prepare a stiff dough. Cover with lid and let it rest for 15 minutes. After 15 minutes, add some Ghee in the dough and knead again. Divide the dough into medium size balls and roll them into thin Roti. Now fold the roti to a semicircle, fold once again to form a triangle. Cook Parathas on medium-high flame. Apply some Clarified Butter on both the sides while cooking. Gently press while cooking and cook until you notice brown spots on both the sides. 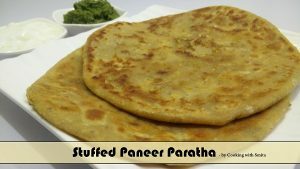 Prepare all the Parathas using the same method. Serve Hot Multigrain Coriander Parathas with Curd, Raita or Green Chutney.